How Adorable is this?! 🙂 Nice work! Clever, clever! Perfect use for a fancy potholder. Are you putting it in the etsy shop? How cute can you get? Not much cuter than the adorable potholder on your purse. I love visiting your colorful and happy place. Super cute and clever! Love the colors, fabric patterns…precious. your blog makes me happy! Oh my, it’s adorable Suzy! Absolutely adorable, and a great use for the pot holder. You are full of inspiration! You are the BEST bagmaker Suzy. This is just a little piece of art! So stinkin’ cute I couldn’t resist! Can’t wait til it gets here! I haven’t seen anything quite like that before. Lovely! Ooohhhhh that is sooo cute!!!!!!! I love this bag!!!!! You are amazing. tres bonne idée d’associer du crochet au tissu, ce sac a belle allure et les couleurs sont agréables. And this one is a beauty too! Love the color and what a great idea to use the potholder like that! Holy cow I look away for a minute and almost missed this. ITS AMAZING. Very clever with the potholders! Love it! It’s perfect! (I have a weakness for aqua.) Is the pot holder a pocket? Wow, I just love the tote! What a fun way to use a vintage potholder. 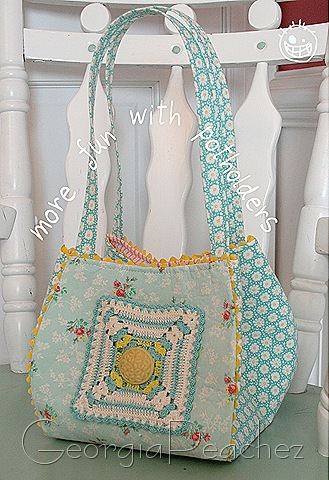 Love the pattern of the tote too! ohhhhhhhhhhhh i love this! i have some of those pot holders and have never had anything to do with them. this is awesome!